Ever notice how everything old is new again? 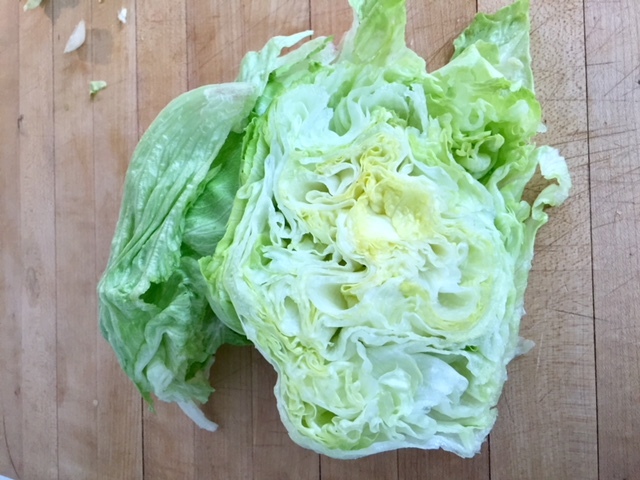 A perfect example would be humble heads of iceberg lettuce. 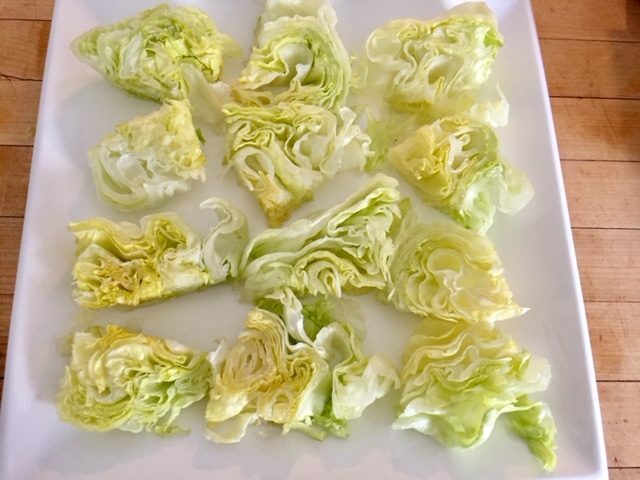 Not so long ago, iceberg wasn’t the”cool lettuce” to serve anymore. It gave way to romaine, Boston, bibb, red leaf, spinach, kale and boxes of baby lettuce greens. Yes, even I admit to snubbing iceberg for years unless I needed to shred some up for a taco topping. Going way back in time, I recall the “Little Store” (as it was known in my neighborhood) and the produce isle was about a six foot refrigerator chest. 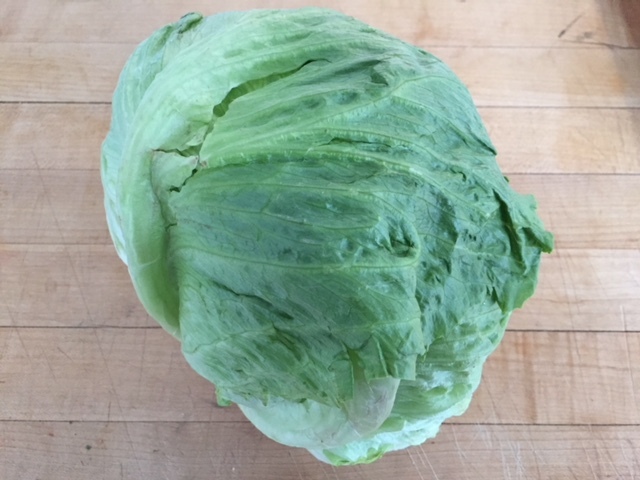 As a small child, I only had to learn the difference between heads of iceberg and a green cabbage. Then along came Caesar salads and spinach salads, first in restaurants and then on family tables. That was the beginning of the produce boom that has changed the way America eats. Like all good things, iceberg had its glory days. 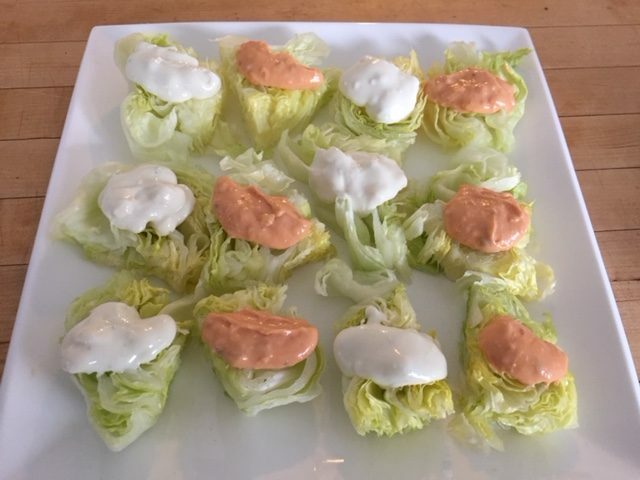 A popular mid century salad was an iceberg “raft”. This was basically a large slab topped with either bleu cheese dressing and bacon or thousand island dressing and chopped hard boiled egg. Well guess what? Rafts are back and bigger than ever where they can often be found at trendy restaurants and upscale steak houses. So the Super Bowl is coming up and with it, hot buttered Buffalo wings, pizza, chili, nachos, foot long subs and other tailgate favorites served round the TV. But what about those guys who stopped eating carbs for their New Year’s resolution (like mine) or guests who don’t even eat meat? 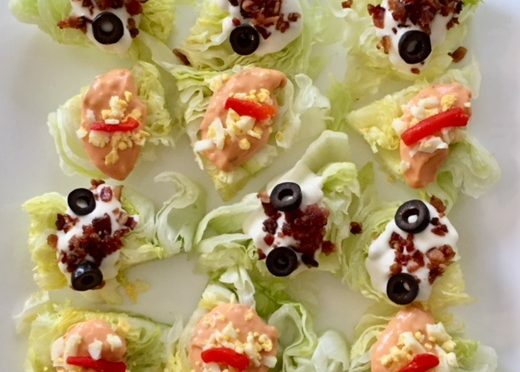 Welcome to the lighter side of football food… Mini rafts are salads you can pick up and eat with your hands. 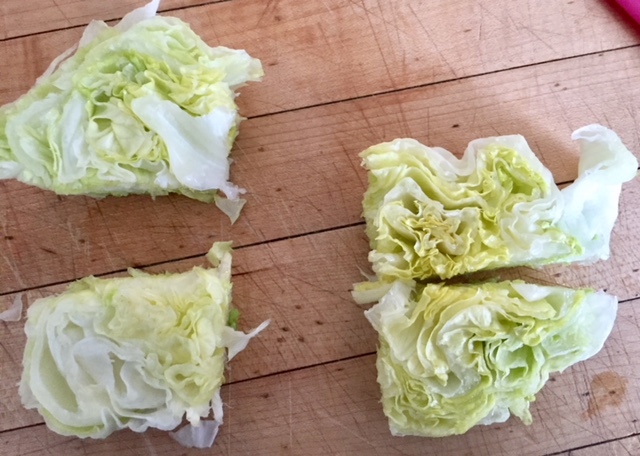 Nothing could be easier to make, just start with a head of iceberg. 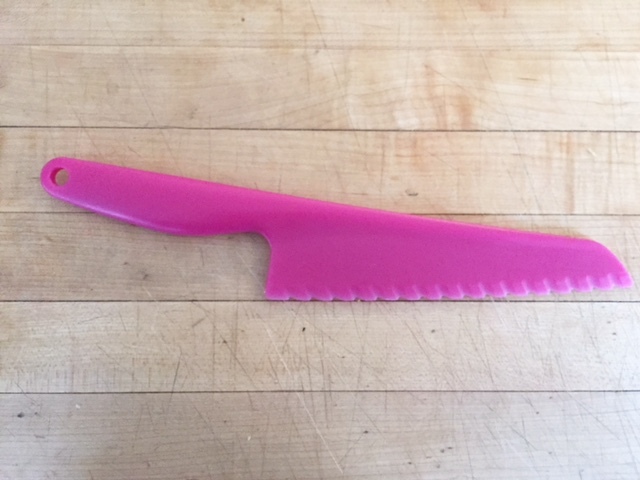 Be sure to always use a plastic knife as iceberg will turn brown really fast if cut with a metal knife. Slice into 1 1/2 ” slabs. Cut slabs into quarters and arrange on a platter. Top with bleu cheese and 100 Island dressings. 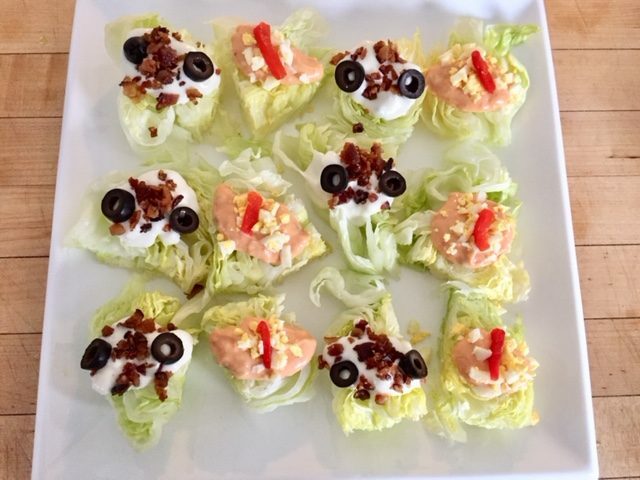 Bleu cheese dressed rafts with crumble bacon and sliced ripe olives. Thousand island rafts with chopped hard boiled egg and strips of pimento or rasted red pepper. That’s about as easy as it gets and next Sunday I think you’ll find it surprisingly popular!